This year is the 100th anniversary of the end of World War 1, and Saul Dibbs’s intense adaptation of RC Sherriff’s play is a heartfelt tribute to the men who fought in the trenches in northern France. Sherriff himself based the play on his experiences as a soldier during the war where he fought at Vimy Ridge and was badly wounded at Passchendaele. The action is set over four days in March 1918. The troops are expecting the Germans to make one last desperate attempt to win the war in an offensive that became known as Operation Michael. The Allies, in the wake of the futile, bloody Passchendaele offensive at the end of the previous year, are in a state of exhaustion with the frontline trenches thinly manned. Idealism has long since disappeared, post-traumatic stress is everywhere apparent. “We’re here because we’re here because we’re here,” sing the soldiers as they march. A young officer, Raleigh (Asa Butterfield), just out of school, arrives in France and pulls strings to join C-company, a unit commanded by his former housemaster, Captain Stanhope (Sam Claflin), who is also betrothed to his sister. The man Raleigh fondly remembers and the man he meets are poles apart. Stanhope, who has served throughout the war, is now a tormented semi-alcoholic, mentally shredded by the hell of the trenches but still aware of where his duty lies. We are also introduced to the other officers in the dugout, including Osbourne, known as “Uncle” (Paul Bettany), a loud-mouthed disintegrating Hibbert (Tom Sturridge), the rock solid, kindly Trotter (Stephen Graham), and the indefatigable cook, Private Mason (Toby Jones), whose dubious concoctions are introduced with rough wit. This is not a film about battle so much as a claustrophobic portrait of the mental anguish of men at war, waiting for their Journey’s End. Simon Reade’s faithful adaptation of the play is, inevitably, wordy, but never stagey. There’s humour, horror and tension aplenty as the officers and men try to direct their thoughts at anything but the war. The historian-politician Alan Clark’s description of British troops as “lions led by donkeys” is acknowledged in a number of scenes, not least when the company is ordered to go on a semi-suicidal daytime raid to capture a German soldier for information, just a day before the expected attack. The film effectively builds the almost unbearable tension felt by both the officers and the other ranks as they await battle. Laurie Rose’s cinematography brilliantly captures the gloom of the dugout and the dirty browns of the muddy trenches and devastated no man’s land, while Natalie Holt’s grinding score underlines the sinister ambience. Some might complain that the action scenes are too short and lack the panoramic impact of a film like Dunkirk. This is to miss the point. 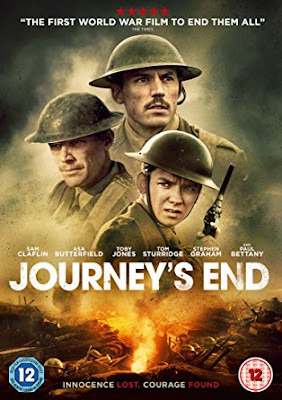 Journey’s End is not an action film so much as a movie about the camaraderie and tensions between men who increasingly see themselves under sentence of death. In this, it has succeeded only too well. Director Dibbs gets excellent performances from his entire company of actors, specifically Clafflin as the tortured Stanhope and Bettany as the calm, wise Osbourne – his conversation with Raleigh just before the raid is one of the film’s highlights.